Rome, Italy. 5 - 6 December 2011. 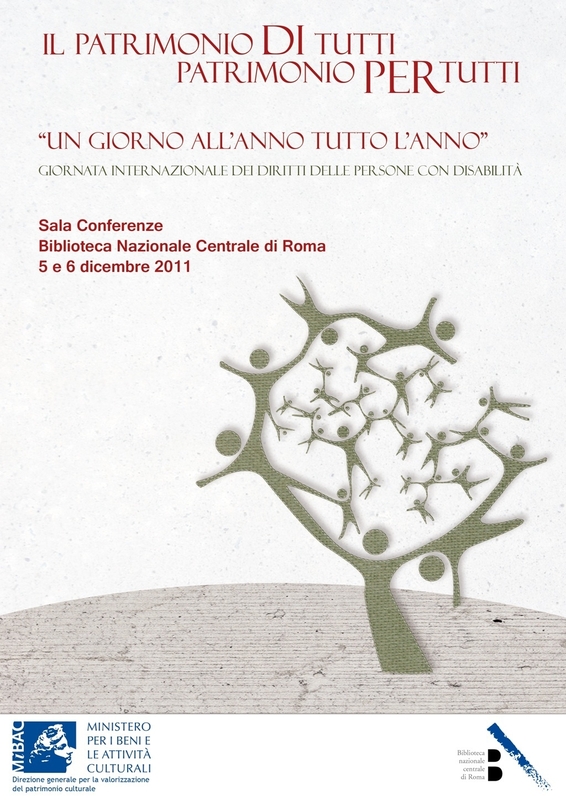 On the occasion of the “International Day of the Rights of persons with disabilities”, two major events will be organised by the Italian Ministry of Cultural Heritage in the Conference Room of the Central National Library in Rome. This is an opportunity to stress the commitment of the Ministry on the issues of the accessibility to the built, social, economic and cultural environment, the access to information and communication on the vast Italian cultural heritage, through the promotion of success initiatives. On the 5th December 2011 at 15.00 pm, based on the Ministry consolidated principle “One day a year for the whole year”, different cultural events will be presented, as the new edition of the “talking Book”, the theatrical performance “Emotions in every sense”, played by the actors of “Association Li-Fra Theatre beyond silence” a new form of theatre for a wider accessibility and the closing concert of “Four Seasons” of Antonio Vivaldi, performed by the Orchestra “Ensemble Le Muse”, directed by Laura Simionato. The second day, 6th December 2011 at 9.30 am in the Conference Room of the National Library, the General Director for the enhancement of the cultural heritage Mario Resca will present the project “A.D ARTE- The information - An information system for the fruition of the cultural heritage by people with specific needs”, whose main purpose is to upload in the MiBAC web site all the necessary information regarding the real conditions of accessibility of the public cultural sites. The event will continue with the Convention titled “The heritage of all, a heritage for all”, presented by Mario Resca and Maurizio Fallace who will introduce activities and projects for a wider accessibility of the cultural heritage. The General Director of INAIL Mario Carletti and Giovanni Sansone President of the Integrated Social Cooperative Tandem will also attend. The main objective of the Convention is to give the occasion for reflection regarding the “culture of accueil”, as well as sharing information, experiences and actions with the scope to exploit the Italian cultural heritage as a right for all. International sign language translation will be provided during both days. Download the Programme, poster and further information from the right-hand panel. “Il Patrimonio di tutti, Patrimonio per tutti”.